Barbecue salmon steaks are the perfect elegant dinner for your next outdoor gathering. Salmon is a versatile fish that takes on added dimension on the grill. This rich, meaty fish is sure to please. There are a number of ways to prepare salmon, from steaming to sushi, but one of the more overlooked methods of preparation is the barbecue. When you are preparing your salmon for the barbecue, keep the cut of the fish in mind. Salmon fillets are much thinner and more likely to dry out in the hot environment of the grill. Salmon steaks are thicker, able to be turned with ease and are more likely to maintain a moist center throughout the cooking process. Use a sharp knife and make small cuts in the fish as close to the skin as possible. Hold the skin firmly in one hand away from the fish when you begin to free the skin. This will allow you to remove the smallest amount of fish as possible as you remove the skin. Place your fish in a lidded container and immerse it in the liquid. Refrigerate your salmon as it marinates and use the left over liquid to baste the salmon with as it cooks. If you choose not to marinate your salmon steaks before barbecuing, try rubbing the surface of the fish with various spices before placing it on the grill. Place all ingredients in a resealable container. Baste salmon with sauce and let sit for half an hour. Spray a rack and shallow pan with non-stick spray. Place salmon steaks on the rack, skin side down. Place the rack in the pan. Broil in the oven or cook on the grill for seven to 10 minutes or until the salmon flakes easily with a fork. Just as there are multiple ways to cook salmon, there are also multiple ways to barbecue salmon steaks. Try one of these suggestions for marinades the next time you barbecue. If you are a sushi lover, you will also love this marinade for lemon soy salmon. Immerse your salmon steak in a mixture of equal parts lemon juice and soy sauce for one hour before barbecuing. Baste the steaks in the leftover liquid as they cook. 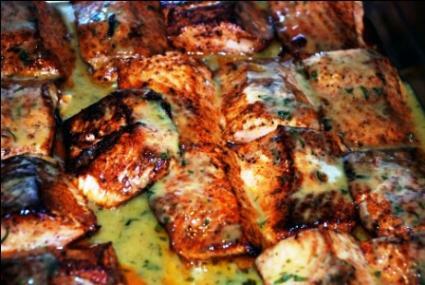 If you have a sweet tooth, try some orange honey salmon marinade the next time you barbecue. Combine 1/2 cup of honey with 2 cups of orange juice and marinate the salmon for half an hour. Drizzle a little extra honey over the steaks just before you place them on the grill. If you're a barbecue purist, try this sauce over salmon for a traditional barbecue flavor. Combine 1/2 cup of lemon juice with 1 teaspoon of mustard, 1/2 cup of vegetable oil, 1/2 teaspoon of pepper and 2 tablespoons of brown sugar. Pour them over the fish just before you barbecue, saving some for basting as you turn the fish. Remember to coat your grill with a little oil before you place the fish on it to keep it from sticking. Salmon tends to flake apart after it's cooked, so it may need a little more help than traditional barbecue meats. Serve the salmon alongside some grilled vegetables and start the warmer months off right.